Billabong, a true favorite amongst the beach-bum in all of us, gives us a head start for the summer! The popular brand has prepared a collection that combines the apparel brand's beach lifestyle aesthetics, and action-sports focus, with, wait for it, Bob Marley. It's been a long time coming, but Billabong finally partners with Marley & Co to produce the Billabong X Bob Marley Collection. It's a collection that features iconic Bob Marley images and reggae-themed colors on tees, boardshorts, tank tops, and accessories, reflecting the spirit of the musician’s universal message of "one world, one love." Billabong also boasts that all the products in the much-awaited collection will be environmentally safe, and wholly organic. The reggae legend sure would have been glad to hear that, were he alive. 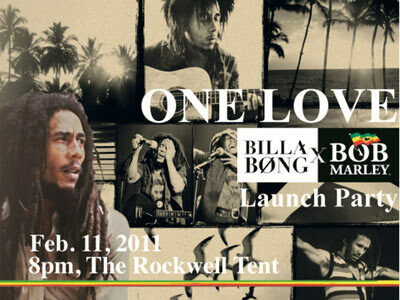 In celebration of this collaboration, the Billabong X Bob Marley Collection will be launched on February 11, 8 P.M. at the Rockwell Tent, in an event called One Love. It's going to be a night of art, music, and festivity, as the event not only welcomes the new collection, but also pays tribute to Bob Marley's incredible passion for his music, and his ideologies of global peace. Joining the event are some of the country's grooviest acts including DJs Red-I and Soulflower, bands Cosmic Love, Coffee Break Island, Spy, and Tropical Depression. For one night in February, Bob Marley's messages of social equality, anti-racism, love, and friendship will truly be alive. Ya like that? If you want to score invites to the event, then do register at Aloha Boardsports stores now, or go to the Aloha Boardsports (official) page now on Facebook, and like the page. The collection will be available at all Aloha Boardsports shops by mid February.